Skeletal muscle covers the skeleton and gives the body shape. Skeletal muscle is the type of muscle that is most often thought of when the term "muscle" is used. 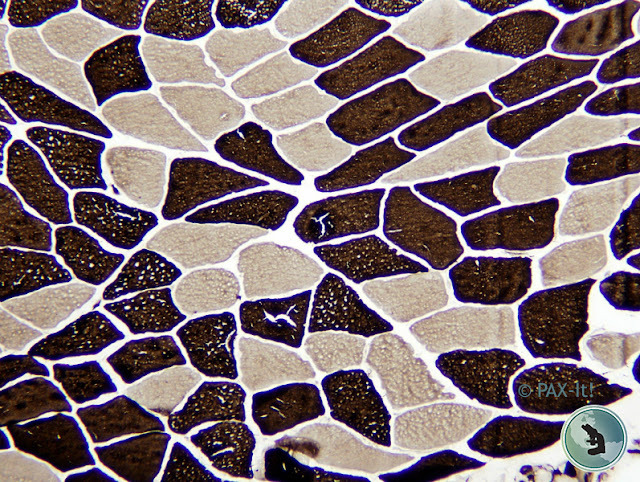 Skeletal muscle under the microscope captured with a PAX-cam microscope camera. 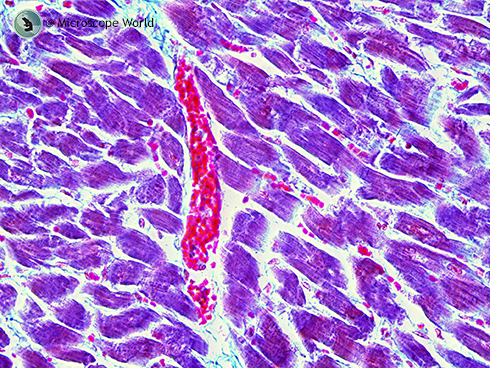 Smooth muscle (shown at left) is found in walls of hollow organs such as the stomach. Smooth muscle tissue tends to demonstrate greater elasticity than other muscles. It is also found in the urinary tract and digestive tract. Cardiac muscle is only found in the heart and it is different from the other muscles in the body because it does not get tired. Learn more about the human cardiac muscle here. Human cardiac muscle captured under the RB30 microscope with a 5mp microscope camera. View more images of cardiac muscles captured at different magnifications under the microscope here. Each of the 3 types of muscles in the human body plays an important function in every day life. To learn more about healthy muscles and the roles they play in the human body visit NIH here.